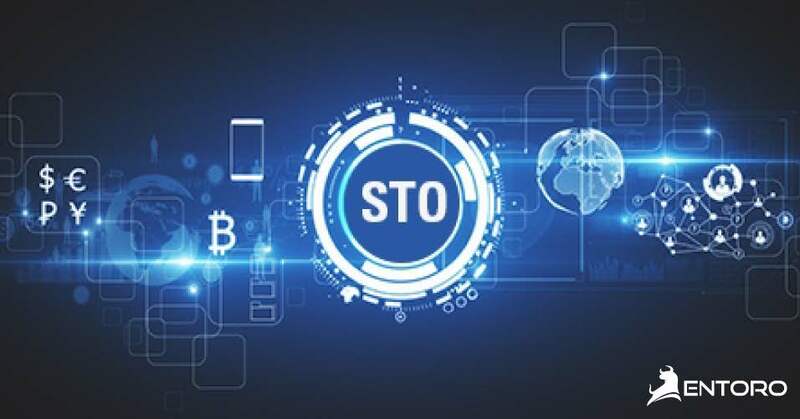 At Entoro Capital, we believe the introduction of security token offerings (STOs) into the financial services sector will not only stabilize the investment landscape, but will radically disrupt Wall Street’s old-school ways. Forward thinking technology players are excited that software decentralization will be the disruption catalyst; however, that can only hold true if the intrinsic and extrinsic benefits outweigh the cost. Put simply, do STOs save time and money? We have yet to see an analytical review, so we decided to tackle it ourselves. Based on our analysis, the STO may just rule the securities world and enable us to create faster and more cost-effective financial instruments. 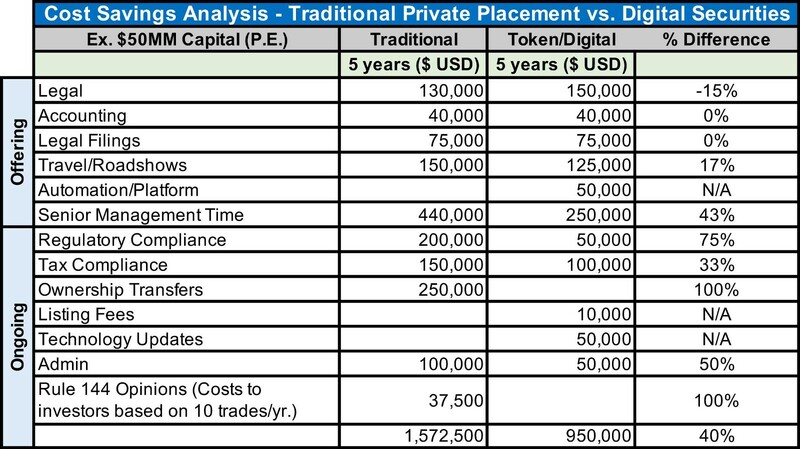 The table below captures our attempt to summarize the relevant costs of digitization compared to traditional methods of capital raising. placement costs using paper, there could be countless factors that significantly change the outcome of any simple analysis. Our analysis shows the savings may be 40% less expensive using digitization versus a traditional method of raising capital. At Entoro, we believe there is an unlimited number of structures, costs and benefits to be perfectly precise. However, the purpose of this analysis is not to state a final answer, but to ignite debate. Any discussion around the purpose of tokenization and digital financial instruments must ultimately benefit all stakeholders by decreasing expense, being easier to use, standardizing format, increasing compliance and reducing friction for global Investors. Barring that, the adoption to tokenization will be on a long path. 1. Legal — Are legal costs going to save you money day one? No, but will it save the Issuer and Investors $3.3 million over five years on a $50.0 million private placement? Yes! And that’s what matters. Even if the answer was $1.0 million in savings, tokenization is worth it. hours, Investors will each save thousands of dollars, and all participants will have greater trust and transparency in the company’s and their own transactions. 3. Time — The amount of time senior executives spend in oversight and handling the administrative tasks related to their Investors’ securities can be extremely costly. If 30 hours per month were cumulatively spent on this oversight, at an annual salary of $400,000, the cost adds up to $440,000 over a five-year period. However, if those same assets were issued, held, and transferred on a blockchain, it would dramatically reduce the time they spend on: a) legal counsel, b) Investor communications, and c) compliance processes. 4. Compliance — Money spent on regulatory compliance can be saved because the company does not have to hold an annual token holder meeting, and tax compliance costs can be reduced $200,000 over five years. However, this amount may be significantly underrated and may be much higher in the future as all aspects of an investment’s life will require increased compliance management. 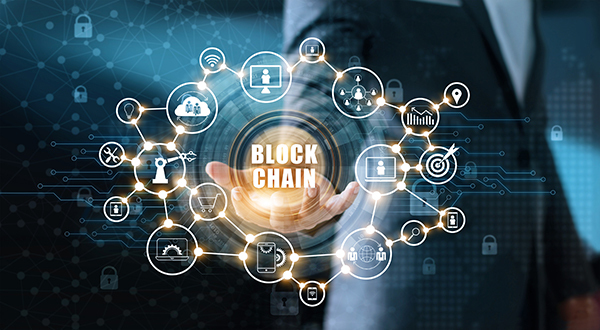 This assumption presumes that record keeping, audit standards, and methods of reporting are on the blockchain with automation software connected and capable. 5. Custodial — The majority of the savings come from money saved in ownership transfers. On the assumption of a single turnover of all tokens at 5% over five years, the cost to the company would be $2.5 million. Getting rid of the need for a transfer agent to record transactions, cancel and issue certificates, process Investor mailings and deal with lost or stolen certificates, this point alone makes it all worthwhile. The blockchain and a block explorer that gives thorough insights is able to disintermediate the entire cost of this burden. blockchain there can be no conflicts as all records are indisputable. There can be conflicts if the data entered stored or transmitted using the blockchain is in error. Garbage-in/garbage-out still presents a risk; however, blockchain should minimize that risk. 7. Rule 144 — Another cost saving in favor of the shareholders that must comply with Rule 144. Sellers typically pay $500 to $1,000 for a legal opinion before selling the securities they hold. However, with a little help from oracles, smart contracts are able to lock and release securities from holding periods and can limit the selling of securities. Along with the tangible costs and benefits, there are numerous intangible benefits to motivate an Issuer to want to digitize their offering. 1. Liquidity — Enables potentially increased liquidity due to secondary market trading after one year as opposed to waiting for a multi-year exit in a traditional investment, depending on relevant laws. 2. Blockchain Technology — The public blockchain provides both the Issuer and Investor an immutable contract. Actions, plans and operations of a token are coded into the digital smart contract allowing a known set of actions and future activities. 3. Smart Contracts and Efficiency — Smart Contracts provide programmatic regulatory compliance enabling more efficient security sales and investment exits by reducing intermediary fees. 4. Global Investor Pool — May utilize a combined Reg. D 506c and Reg. S filling which allows an Issuer to attract both US and non-US Investors under the rules of a SEC compliant offering. 5. Security — Provides regulatory certainty, increased due diligence, legal review, quality documentation and peace-of-mind that the offering has multiple levels and layers of review. 6. Brand Awareness — Due to online focus of the marketing campaign, token offerings attract a broader Investor interest and response, where Investors and supporters can take on the role of brand ambassadors. 7. Time — What can a company gain if even one employee did not have to spend time working on the management and oversight of their Investors’ securities and the reporting/compliance that goes along with it? Could that employee spend that time on implementing new measures to save time and money? Could he/she have created a new revenue stream for the company? 8. Projects and Defined Subsectors — Tokens are most appropriate for well-defined projects or investments that have a specific event or cash payment/s that can be managed or ringfenced. 9. Fractionalization — Security tokens allow for easier fractionalization of assets and the revenues they generate. 10. Success vs. Failure — Even more important than the cost savings is pure success over failure. The fundamental structure of a private placement, if not architected properly, can be the end of a company. Traditional structures work most of the time, but when companies think outside the box, their capitalization strategy and incentive structure may need to be cutting edge. Digital securities offer the freedom for alternative investment structuring customization in order to distribute a deal that is attractive and fair for everyone that can participate. In summary, we believe the hard costs of undertaking a digitized securities offering are currently lower than traditional ways. From our analysis the cost difference over a five-year period may be 40% less, more than compelling to move to a digital format for private placement securities. As digitization continues to be the driving force behind capital formation, the tangible costs will continue to decrease to a point where no paper will be issued for securities ownership. When you combine the tangible or known costs along with the 10+ intangible benefits of tokenization, there is no doubt that Issuers and Investors will benefit from digitization.